TEPIN struck a blow for North America as she overcame challenging conditions to hold off Belardo in the closing stages. The Breeders' Cup Mile winner became the first horse from outside Europe to win the Queen Anne, despite punters looking elsewhere in the days leading up to the race as the ground softened. Tepin raced at the head of a group of four runners closest to the stands' side, and the superstar mare took over from Kodi Bear with more than a furlong to run before finding plenty to repel the soft ground-loving Belardo and win at 11-2. In the end, the winning margin was half a length, with Lightning Spear staying on late to grab third, another length and a quarter adrift. The soft ground only added to the concerns of those who were worried about the chances of Tepin racing without her customary Lasix and nasal strip and with doubts about her ability to handle the straight mile, punters looked elsewhere. Lockinge Stakes winner Belardo was sent off the 9-2 joint-favourite with Ervedya, but Tepin produced a mighty display, being the only runner at the business end of the contest to have raced prominently throughout. In the end, her winning time of 1:43.87 was the slowest since 1988, largely due to the conditions but jockey Julien Leparoux, the French-born rider having his first ride in Europe, did not mind. "It's a great feeling and she's proved she's a champion today," he said. "She had to work hard." Owner Robert Masterson was equally thrilled and hopes his mare's success will encourage other Americans to target Royal Ascot with their most talented performers. "She is the best thing in the world," he beamed. "It's all her, we just represent her. She is fantastic and she did a fantastic job again today. "People say the Americans need to have drugs in their horses. Well she had no drugs in her, no nasal strip, nothing anyone was worried about in the papers and she just performed magnificently. It's a great message to send back home." 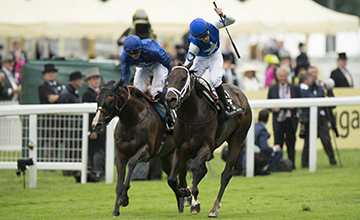 Masterson admitted he had shared some of the concerns about the ground and conditions of the Queen Anne Stakes but said Tepin showed her class in overcoming those challenges. "The one thing we were worried about was the ground," he said. "She's won on the soft before but we didn't know exactly how it was and she'd never been on a straight or up a hill.